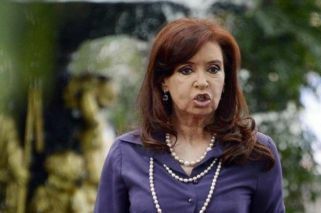 Senator Cristina Fernández de Kirchner will face trial on February 26. It will be the first time she will stand trial, despite a raft of corruption charges against her. Former president Cristina Fernández de Kirchner will stand trail for the first time on February 26, after a court rejected her bid to postpone proceedings over alleged embezzlement against her and other former government officials. Senator Fernández de Kirchner's legal team claimed the trail should not go ahead until the full investigation had run its course and a 10-day cooling-off period had concluded. Her alleged frontman Lázaro Báez, former Planning minister Julio de Vido and former Public Works secretary José López are among the defendants in the so-called "Road Works" scandal, which involves alleged embezzlement of public funds through tender processes for road words in Fernández de Kirchner's home province of Santa Cruz. Federal Oral Court 2 rejected the defence's request on the grounds the investigation was sufficiently complete for the trail to begin, and despite a Procedural Criminal Code article which indicates a trial should not begin until 10 days have passed since the conclusion of an investigation.